Prayers for Peacemakers: December 2017. CPT Iraqi Kurdistan team celebrates with its long-term partners, community of Baste, and leaders of nearby communities, that Baste has finally gotten connected to the electrical grid. This connection is what the people of Baste, a well-known ancient "Peace village", enduring for three decades under the shadows of Turkish and Iranian bombs and rockets, have struggled for for many years. However, not only good news come from Iraqi Kurdistan. On 12 November, a 7.3 magnitude earthquake hit Kurdistan on both sides of the Iraq/Iran border, killing more than 700 people and wounding thousands. At the time of the earth trembling, Turkish warplanes were firing rockets on the mountain village of Gallala, located about 35 miles north-east of Suleimani. This is the nearest Turkish attack that CPT has ever recorded. And a first ever bombing in this area. Since the Iraqi crackdown on Kurdistan autonomy, the Turkish airstrikes have intensified and expanded to new regions much farther from the border. The fighter jets bombed the vicinity of Gullala five times since the beginning of November. This week’s bombing was the heaviest and also the nearest to the village homes. 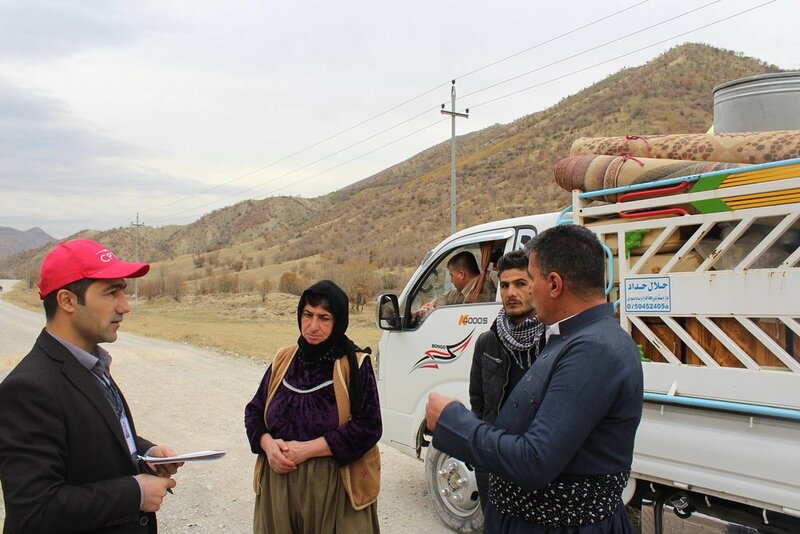 The resident families fled their village, some to Suleimani, others to places around Mawat district. CPT met with several of the displaced families yesterday. They told CPT “We saw the bombs falling down from the sky. They were very big and looked heavy. Some of them exploded in the air and when they did, we smelled a strange smell”. One family was staying in an unfinished house about half an hour away from Gallala. The family has no other place to go as it is too dangerous to enter the village. When CPT arrived, the family was sitting around a small fire with two children. Their words were heavy, “We were very frightened when we heard and saw the bombs coming down. We waited for the snowfall this winter, not bombs”. Please, carry in your thoughts and prayers the Iraqi Kurdistan team and our future during these difficult times. CPT meets with villagers fleeing Gallalla Village.